Within documentary, it is a reasonably fail-safe approach to find an intriguing space and use it as a frame for exploring the people who interact with it. 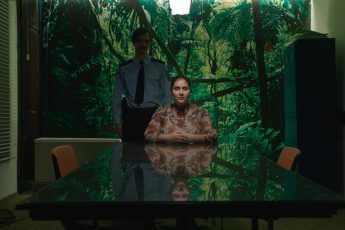 Hristiana Raykova’s film validates this hypothesis by focusing on the titular “pit”, which, despite the connotations of dankness and the infernal evoked by the term, actually belongs to a more celestial realm, at least on a visual level. 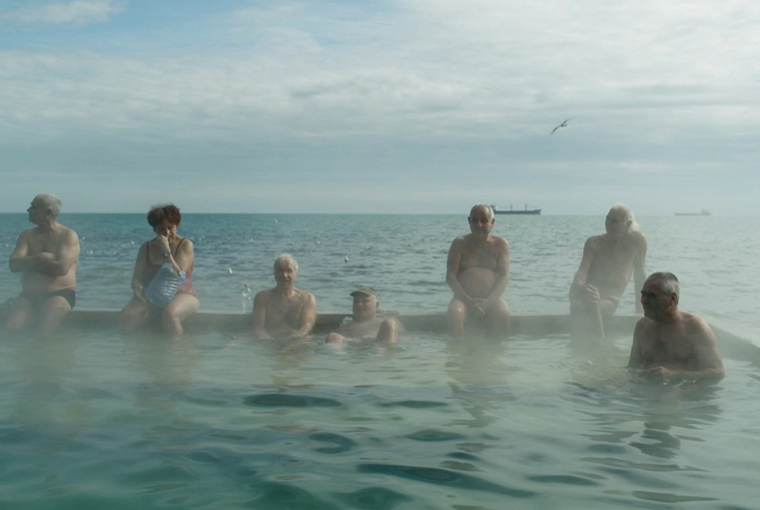 Consisting of a communal bath located on the shore in Varna, Bulgaria, steam from the mineral water engulfs visitors, swirling against a pastel backdrop of pinks, blues and greens. The lack of entrance fee combined with the healing properties of the thermal springs attracts a disparate range of regulars, with the daytime dominated by men of a certain age while in the night time it becomes a haunt for a younger gay crowd. In addition to its stunning appearance, it soon becomes clear that one of the aspects that makes the space so special is its self-organized management structure. Unaffiliated and therefore unsupported by the municipality, maintenance of the pit is undertaken by a dedicated group of bathers. They cooperate together to empty and fill the pit, scrub it down and fix its leaks – although admittedly a rival group obstinately insists on playing cards and turning a blind eye to the work being carried out around them. This revelation casts a new light on the community and imbues the pit with a new socio-political depth. Moreover, it also provides a platform for numerous amusing scenes as the gang bickers and grapples over the practicalities, such as spray painting the shower heads to make them “ugly” and therefore less of a temptation for potential thieves. Sadly but unsurprisingly, it is also soon revealed that the whole infrastructure is under a double threat. On the one hand, there are pressures from the city to make the pit regulated and state-controlled, while on the other, the demands of capitalism would see it privatized and no longer accessible for free. This latter option in particular would spell the end for a number of the users – in the words of Alexander, one of the older bathers, “who can afford 10 Lev out of a 150 Lev pension?” Needless to say, the pit community is quick to react and fights back by collecting signatures and staging protests. To the film’s credit, this drama does not take over the central narrative dictating the structure. Rather, it remains just one of the various threads being followed as part of the broader mission to get to know the characters and their motivation. The focus remains on a small sample of pit users to provide a cross-section of society in Varna more generally, with various themes emerging throughout the various cases but without a set agenda. One of the more prominent recurring questions is that of immigration and integration, especially in relation to the city’s Russian population. Indeed, Genadi, one of the core protagonists, is originally from Siberia and speaks very highly of his new home, where he runs a petting zoo. His involvement in pit life shows an evident desire to establish himself among the locals, but unfortunately, as tensions over the organization of the site escalate, the authorization for his business is revoked – as retaliation, according to Genadi – and his residency is called into question. Taxi driver Dimčo claims to have found the love of his life in his new Russian girlfriend, who leaves Moscow to move into his place together with her son. The tradition of cross-border work can also be seen in the case of Alexander, who reminisces about spending his youth working abroad, and delights in the opportunity to speak German to Raykova’s German crew. Related to this, one of the other dominant topics is instability and the need to adapt. While the men are quick to invent solutions for the various problems that arise at the pit, it is apparent that they are also used to doing the same thing in their own lives. Housing in particular seems to be a point of fragility, as Alexander rents out rooms to supplement his meager pension, Genadi ends up living on the beach after a fire in his home, and Bobi is forced to move in with his boyfriend, despite the arrangement strongly conflicting with his free-love lifestyle. Again, the importance of the pit becomes apparent as a fixed point of constancy with a reliably unchanging group of people. In this way, The Pit is not explicitly presented as a social critique. Rather than rail against the obvious failings of society, it simply presents the protagonists and their own personal challenges, celebrating their humanity and resilience instead of invoking pity or assigning blame. Thanks to its warmth and gentle humor, in combination with the stunning panoramas and captivating images, the film draws viewers into the world of the pit and inspires empathy on a very intimate level.